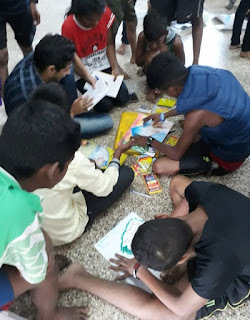 As part of internship program 7 First year BMS Students from K.E.S Shroff College, Kandivali visited Bosco Boys Home, Borivali from 9 am to 10.30 am to conduct various creative activities for the children of the orphanage. The volunteers began by having one to one communication with the boys. Some prefered teaching; while others conducted creative activities like drawing and painting. Fr. Corlis Gonsalves, the Director of Bosco Boys Home, Borivali, who was very supportive and gave them the approval to visit the orphanage said, “Social workers are a part of the few who do care. They care about social injustices committed every day, across the globe, behind closed doors and out in the open. They are the ones who care enough to believe they can make the world a better place. It’s much easier to forget your personal woes when you’re serving the needs of those around you. For social workers, the needs can be overwhelming. But regardless of the results, the career rewards are intangible. Alone we can do so little but together we can do so much.” He appreciated the noble work the volunteers were doing for betterment of this weaker and neglected section of the society by helping them grow into responsible citizen of the society. “My experience was really awesome. I had a great time with them and hope they will come again to visit us and help us to experience these wonderful moments again.” Vivek Wagela a boy of the Orphanage said.